At 13-years-old, Mo’ne Davis became the first African American girl to play in a Little League World Series. 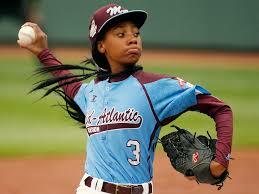 She was the first African American girl to earn a win and to pitch a shutout in the 2014 Little League World Series. She can throw a 70 miles per hour fastball. And her curve ball is positively scary. Baseball isn’t even her favorite sport. Basketball is number one. 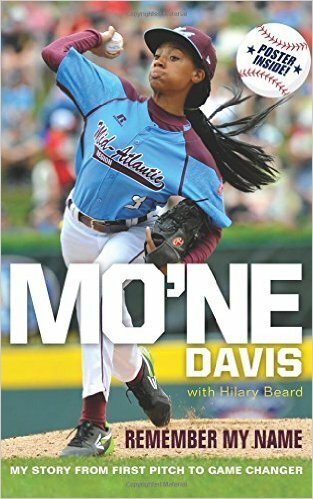 Now she has written a book about her miraculous achievements, Mo’NE DAVIS REMEMBER MY NAME. Girls (and boys) will be inspired by her achievements and will definitely remember her name. This inspiring memoir from a girl who learned to play baseball with the boys and rose to national stardom before beginning eighth grade will encourage young readers to reach for their dreams no matter the odds. At the age of thirteen, Mo’ne Davis became the first female pitcher to win a game in the Little League World Series. She was the first Little Leaguer to be featured on the cover of Sports Illustrated in the magazine’s sixty-year history. And as she began eighth grade in the fall of 2014, Mo’ne earned a place in the National Baseball Hall of Fame—her shutout jersey now hangs in the museum in Cooperstown, New York. Watch these interviews for more about Mo’ne. YES! What an inspiring young woman. I certainly will remember her name. what a fantastic story, and that title is awesome. what a great pitching face, too. nice post, Gwen. I loved hearing about this kid, and love that she’s written a book. No matter what else she does, none of us will forget her.